Ajouter au panier le livre de IGLESIAS A., MONEO M.
Drought, being a normal recurrent feature of every climate, combined with water scarcity has dramatic effects on the economy and the environment of the Mediterranean countries, on the people themselves and the population's well being. Societies tend to react to a drought when it is upon them, by responding to immediate needs and by providing what are often costly remedies attending to balance competing interests. In many cases, this may not be an adequate response in the long term nor contribute to lessen future drought impacts. There is a need to understand drought management consequences in order to improve on the existing management policies. Mediterranean Drought Preparedness and Mitigation Planning (MEDROPLAN) is a project funded by the European Commission within the framework of the EuroMediterranean Regional Programme for Local Water Management. It is coordinated by the Mediterranean Agronomic Institute of Zaragoza-International Centre for Advanced Mediterranean Agronomic Studies (IAMZ-CIHEAM) and involves partner institutions from six Mediterranean countries: Cyprus, Greece, Italy, Morocco, Spain and Tunisia). 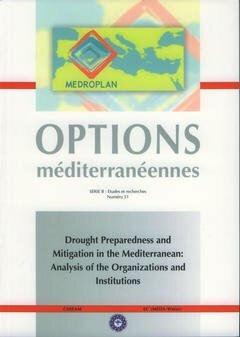 The objectives of MEDROPLAN are to provide guidelines for drought preparedness plans and the framework for the setting up of a drought preparedness network for the Mediterranean countries. This publication compiles the results of the first stage of the project: the analysis of the institutions and organizations relevant to drought and water scarcity management, with special emphasis on municipal and irrigation water supply (project's Work Package 1). The document is organized with a general introductory section that outlines the methodology for the analysis followed up by the country reports. Each country report includes a description of their organizations and institutions and the explicit linkages and hierarchical relations among them. Second, the reports document the institutional experience on the application of the existing drought preparedness and management plans. In addition, the document describes the data collection systems in the country, specifying the institutions responsible, the type of reporting and accessibility, and the primary uses of the data. This information was presented in a workshop in Zaragoza, 15-17 March 2004. The workshop included the participation of sixty invited people representing ail sectors of the water management. In particular, regional representatives, water managers, water engineers, agriculturalists, envi ronmental ists, water users and economists, in addition to the MEDROPLAN partner teams from Cyprus, Greece, Italy, Morocco, Spain and Tunisia, and representatives from CIHEAM and the International Center for Agricultural Research in the Dry Areas (ICARDA).